“The Swallow” is the first book in the Caged Beauty Series, and the debut novel by author Isabelle Joshua. Special Agent Kathryn Bryant was tricked and coerced into working for the NSA by her ex-boyfriend, Evan, who is now her boss. Espionage isn’t all it’s cracked up to be, and after one too many missions extracting sensitive data from disgusting lowlifes, Kathryn vows to make an escape, and begins careful deliberation of her secret exit to her new life. One more mission, that’s what she keeps telling herself, but her latest target, Alex, is unlike any she has ever known. After spending a week with Alex, Kathryn realizes that he is the perfect person to help her escape, but how can she convince him, and will she sacrifice the mission in the process? I thoroughly enjoyed this book. Thoroughly. A bit of espionage, a bit of intrigue, a bit of romance – what’s not to like? The writing is straightforward, deliberate, and often brash, pulling the reader deeply into the story, either through a glimpse into Kathryn’s innermost thoughts or through the witty dialogue between the characters. Three years ago, Kathryn Bryant walked into Orientation making Evan Jackson's desire in law school even more personal. Finally, in their last semester, he decides to take the risk and sit next to her in class. Will he get the aloof bookworm that he's never had the courage to speak to or will she be vulnerable and ready to respond to him? The Swallow is the first installment in a series of mature romance novels. If you like a page-turner that has you wondering what will happen next, a strong female heroine and a steamy hot love story, then you'll love Isabelle Joshua's debut book. Read An Excerpt from The Bluebird. 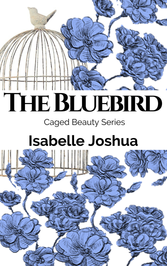 The Bluebird is the second novel in the Caged Beauty Series following The Swallow. The suspense and uncertainty that plagues Kathryn returns, if you enjoy a page-turner that leaves you swooning, then you'll love The Bluebird. “How’s Alex?” she raises an eyebrow at me. “Rachel, those dreams aren’t him. It’s my f’ed up brain replaying my memories as a form of torture..."
Keep up with Isabelle's new releases.